What is RDIT (Rain-based Drought Indices Tool) software? The world is suffering from many natural disasters such as droughts due to climate change. We may need more research activities and monitoring this phenomenon for preparing to countermeasures on droughts. With appropriate tools, we can achieve a better result. One of this tools are drought indices, however calculating the indices are not easy for users and they need a user-friendly software application to calculating them. So, the "RDIT" tool can calculate and perform rain-based drought indices. This software can calculate eight indices of meteorological drought. You can draw graphs and estimate the severity, onset, and end of each period's drought. Input and output data are in excel format file. For input data, RDIT is smart. It can assess your data and check blank cells and produce data for "null" cells. This software calculates SPI (Standardized Precipitation Index), DI (deciles index), PN (Percent of Normal Index), RAI (Rainfall Anomaly Index), EDI (effective drought index), CZI(China-Z index), MCZI (modified CZI), ZSI (Z-Score Index) in form of yearly, seasonally, monthly and moving average for 3, 6, 9, 12, 18, 24, 48 months. You can save graphs to image files. Meteorological droughts, which is caused by a deficit in precipitation with respect to the climatological average for a given period and region. To measure the value of drought, we need a useful tool. 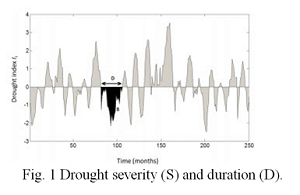 Therefore, to quantitative analysis of drought characteristics and of research works on the impact of climate change on droughts, we should monitor and assess the value of drought indices. Drought indices are often used for detecting the early onset and end of droughts. Meteorological drought indices are useful tools for indicating the number of amount of drought changes in different time scale. Therefore, it is essential that users can easily calculate these indices through software. The RDIT software application can perform and run the eight rain-based drought indices in a user-friendly tool. By plotting various graphs, this software can help the users for better interpreting the results.